A gharial is a type of critically endangered crocodile found in Pakistan. Pakistan has a wide variety of habitats including wetlands, highlands, alpine scrubs, mountain ranges, temperate forests, and floodplains which are home to various reptile species. Pakistan is home to more than 195 reptile species including crocodiles, lizards, chameleons, geckos, turtles, skinks, agamas, and tortoises. Out of these species, about 13 of them are endemic to Pakistan. Due to poaching, habitat loss, and pollution, some of these species have become threatened, and others are facing the risk of extinction. The golden monitor lizard is a least concern species native to Asia. The monitor has an olive to yellow-brown upper body color while the underside is yellowish. Its short hind legs make it hard for the golden monitor to climb trees. The reptile occupies mainly wet areas near forest edges with ground cover for protection. The species can be found in Pakistan, Nepal, Bangladesh, and India. The carnivorous lizard was formerly threatened by international pet trade and currently faces threats from direct killing. The banded kukri snake is a non-venomous colubrid of a body length reaching 24 inches. The colubrid has a smooth, cylindrical body with a short and pointed tail. The body color is mainly light to dark brown with crossbars on the upper parts. The neck is almost as thick as the head. The snake’s diet is composed of insects, insect larvae, spiders, geckos, skinks, eggs of other reptiles, and small mice. The banded kukri snake can be found in terrestrial areas with high elevations in Pakistan, Indian Himalayas, Nepal, and Sri Lanka. No serious threats affecting the species have been identified due to its ability to adapt to disturbed habitats. The gharial is a critically endangered crocodile due to loss of wetlands especially riverine ones and depletion of fish which are its major diet. The gharial has a length of up to 20 feet making it the longest living crocodile species. Its teeth and its long, thin snout are an important adaptation for catching fish. 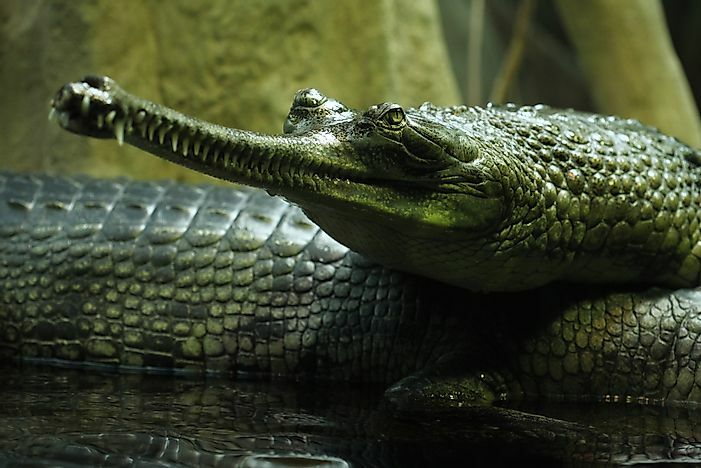 Male gharial can be identified by the pot-like protuberance on the snout tip which occurs at sexual maturity. The cold-blooded crocodiles bask in the sun on the banks of their habitats. Adults find it hard to move on the ground and are therefore mainly resident in the aquatic system. The Mediterranean house gecko is a nocturnal gecko found in most parts of the Mediterranean region and the Asian region. Due to its wide distribution, the gecko is listed as a least concern species. The primary habitats of the gecko include shrublands, rocky areas, cliffs, salt marshes, and coastal areas. The gecko is highly adaptable to various habitats as it can be found in houses in urban areas. The terrestrial animals lay a clutch of one or two eggs per year. Since its independence, Pakistan has been establishing protected areas to cater for her biodiversity. However, many species of reptiles remained data deficient thus not all receive the conservation attention they deserve. Reptiles also native to Pakistan are the Indian krait, oriental garden lizard, mugger crocodile, painted keel-back, Leschenault’s leaf-toes gecko, and the Indian peacock soft-shell turtle.